One thing I’ve learned as an investor at Village Global and avid participant in the crypto community via Token Daily: say “crypto” at a cocktail party and you’re bound to start a lively debate. Investors are unclear what thesis they’re applying to the market. Startups aren’t sure how to package their solution to satisfy everyone. Newcomers struggle to follow along. Maximalists spend endless energy trying to convince one group to think like the other, without fully appreciating where they differ (or align!) on first principles. a) Money Crypto: Maintains that the point of cryptocurrency is to redefine how money works by (re-)introducing Sound Money. b) Tech Crypto: Another belief system holds that the real point is to redefine how the internet works by introducing Web 3.0. Others call these respective narratives “Bitcoin Maximalism” and “Ethereum Maximalism”, but it’s broader and more expansive than that. While there’s overlap between these belief systems, to be sure, they have different aims, different approaches, and different philosophical underpinnings — which leads to some of the confusion. In this article, I will define each narrative, explain where they overlap and differ, and what it means for the community at large. Money Crypto believes that the goal of cryptocurrency is the introduction of Sound Money. 3) Most importantly, can’t be controlled by governments via inflation or confiscation. With Sound Money, governments will be forced to behave responsibly because they are no longer able to borrow from tomorrow (via debt/inflation) to finance wars or fund short-term political objectives at the expense of long-term wealth. Right now we have unsound money, which is a compounding problem. Having the ability to print money — literally and figuratively — increases the power of any government, and any government looks for anything that gives it more power. This inflation, in effect, takes wealth away from people who produce it and gives it to people who control money — without actually producing things valued by society, and it does so without citizens knowing. In other words, governments can do whatever they want: confiscate, inflate, reward nepotism, and finance trillion dollar wars — all while hiding the costs via printing money. At first, the citizens enjoy the newfound services — but they suffer the consequences later as they witness their wealth and purchasing power evaporate. Money Crypto believes Bitcoin is an opportunity to return to our Sound Money roots because Bitcoin is an un-inflatable, disinflationary, censorship-resistant, fixed-supply asset that can’t be shut down by any government and operates without any trusted-third parties. Money Crypto believes that the web is a faulty analogy for studying the nature of money and that we can instead learn more about the future of cryptocurrency from studying economic history and how monies have emerged over time. What can we learn exactly? That whenever people control money, they create more of it — insidiously diluting existing money holders in the process. Money Crypto believes that we should treat cryptocurrencies as money — and not as the next app store or the next software platform that captures all of the VC dollars. Money Crypto is specifically “Bitcoin, not blockchain”. Nearly all Blockchain use cases are not merely unnecessary — they also make the application slower and more expensive. Money Crypto believes that Ethereum is novel and interesting, but the value it creates (let alone captures!) will be orders of magnitude smaller than the next money (Bitcoin). All the apps / dApps being built on top of Ethereum will create some value — but it won’t make ETH, the token, a better money. Yes, Ethereum has many more developers, but Money Crypto believes 1 protocol developer is worth 10,000 app developers. Money Crypto explicitly rejects the Utility Hypothesis, maintaining that digital money’s primary use case will be as store of value first, not medium of exchange. Indeed: Satoshi used blockchain structure in an extremely specific and deliberate sacrifice of a massive amount of speed & cost in order for us to achieve sovereign level censorship resistance, trustlessness, and greater social scalability. 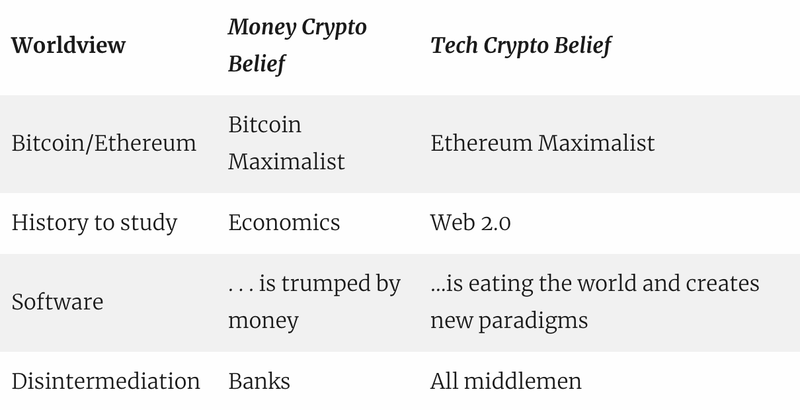 To summarize: Money Crypto believes The Future of Crypto isn’t software — it’s money. Crypto isn’t equity. It’s not a website. It’s not a company. And it’s not a social media network. Tech Crypto, on the other hand, believes we should study the history of the internet and its power structures — rather than the history of money — to help us understand how cryptocurrencies will evolve and usher in the next epoch of the internet, Web 3.0. Tech crypto subscribes to the following narrative . . . Although the internet started as a decentralized and open system, it quickly became centralized and concentrated among 5 players: Google, Amazon, Apple, Facebook, and Microsoft. They in turn addicted users, controlled their attention, monetized through advertising, acquired those that compete, and shamelessly copied those who somehow survived. Far from fulfilling its original vision of decentralizing control, Web 2.0 has in fact created power centers that are orders of magnitude larger than anything that preceded the internet. Although the marginal cost of moving packets around on the internet is 0 — and despite the amazing economic gains and consumer surplus that Web 2.0 has produced — the social costs have been significant: grotesque inequality, end of privacy, fake news, monopolies, filter bubbles, a threat to democracy, and more. Tech Crypto believes that the internet will only have increasingly more of a say in how power and wealth are distributed. Fixing the incentives (via cryptonetworks) is one of the most important things we can do, along with enabling consumers to own and control their own data. Had the token model for network development existed during Web 2.0, things could have played out differently. Tokens provide a way not only to define a protocol, but to bootstrap the operating expenses required to host it as a service. Tokens power the economic incentives to enable distributed computation — compute, storage, bandwidth — at scale in a decentralized way. Tech Crypto views tokens as the most salient innovation in human-coordination mechanisms since joint stock corporations centuries ago. Before the joint stock company, businesses had natural limitations. They were owned outright and no liquidity to raise capital. The advent of joint-stock corporations, and more recently publicly traded corporations has produced incredible businesses that wouldn’t have been possible otherwise. We’ve seen, however, the faults of those same systems: only employees are rewarded. Value of a share of stock is a function of profits. And profits reflect a company’s ability to monetize data — not the actual worth of the service. When a company reaches a certain size their incentives become misaligned with their users and developers building on top of them. Tokens also do something else which may enable the disruption of hitherto unbeatable network-effect businesses: they — in theory — incentivize orders of magnitude more people to contribute to the network. This includes all stakeholders — users, developers, contractors, speculators — not just employees. Instead of accruing value by ownership (like equity), network participants accrue value by improving underlying protocol. This includes mining, validating, building on top of, or using the service. How do you create the next Facebook? Give millions of people upside in its success, the theory goes, instead of just a few hundred. And it’s not just tokens. Every aspect of blockchain infrastructure becomes a building block for the next developer looking to build something on top of it. This leads to compounding innovation since every application leads to more possible applications. Just look at standards such as ERC721 or 0xturning into memes, leading to more companies starting, which then become building blocks for creating more innovations on top of them. In contrast, Web 2.0 naturally led to silos and consolidation. Tokens are the fuel that both incentivizes protocol maintenance and development, as well as guarantees enforcement of trust and openness. Tech Crypto says the blockchain will disintermediate all middlemen — not merely all of payments ($500B,) but banks, social networks, marketplace operators, etc. Tech Crypto says that in order for money to be money it needs to be used as money. Tech Crypto is more bullish on Ethereum (but more open to many winners). They see BTC as digital gold and Ethereum as the world’s computer, and are eager to build millions of dApps on it. Tech Crypto compares blockchain to the early web: people said the web wouldn’t scale either, that it was an unnecessary toy. Tech Crypto says that software tends to rewrite the rules of things it runs into — “software is eating the world” — and crypto is no different. Tech Crypto says don’t bet against developers. In reality, it’s too early to tell whether either or both of them are right — nor are they mutually exclusive. It’s possible that both are right about the eventual outcome but merely disagree about the order of operations. There are a lot of people in Tech Crypto who are sympathetic to the Money Crypto narrative as a major component of decentralization. Ultimately, Money Crypto approaches this tech from a largely Austrian economics perspective, looking at at how monetary media have evolved over history and then trying to replicate those same characteristics in digital form (Saifedean Ammous’ The Bitcoin Standard is the manifesto here). Tech crypto, on the other hand, thinks that those historical examples only go so far. Having money wrapped in software creates entirely new paradigms, opens up the design space, and potentially even means that this time around, money will take a much different path than it has historically. Some of these factions not only disagree, but also think of the other as detrimental. Parts of Money Crypto believe that tech crypto is detrimental as it obfuscates the “real value” of crypto — Sound Money — and that ICOs distract developers from working on Bitcoin. There are parts of Tech Crypto that believe that the Money Crypto narrative — and the often aggressive and hostile nature — is turning people away from using or building on top of cryptocurrencies. It’s reminiscent of the great Slate Star Codex post about group infighting. Take Vegans and Paleo fans, for example. Rationally, observers of both vegans and paleo diets should work on getting the general population to eat fewer cheeseburgers, because either diet is clearly an improvement over the status quo. But, in practice, the human dynamics are such that they will not stop fighting with each other precisely because their viewpoints are so similar. Similarly, I’d argue, any animosity between Money Crypto & Tech Crypto is better directed towards their common enemies: central banks, corrupt governments, tech monopolies, etc. I’d go further and say that both belief systems can benefit from each other’s rise. Without Money Crypto helping make crypto a good form of currency, Tech Crypto can’t accomplish its goal of letting people get paid for hosting/mining/participating because they need their currencies to have value and be seen as compelling incentives. And without Tech Crypto builders, Money Crypto people are climbing up a hill because having a new ecosystem around digital currencies will give them credibility and value. (See the graph below — when crypto value gets higher, more people get wallets. More people having wallets means more people can use dApps). To be sure, these concepts — Money Crypto & Tech Crypto — could be classified any number of ways, but for the sake of clarity, we’ve excluded other, more granular factions. What’s important to realize here is that not only can these narratives both exist, we may find that they ultimately leverage and further the other’s chance of success. As entrepreneurs in the blockchain space, aligning around shared values should take precedence over disagreeing over ideological differences that will resolve themselves over time. We’re ultimately all just hypothesizing about the future and see blockchain as a way to solve some of the world’s most pressing problems. Learn more at www.villageglobal.vc or submit your startup here.